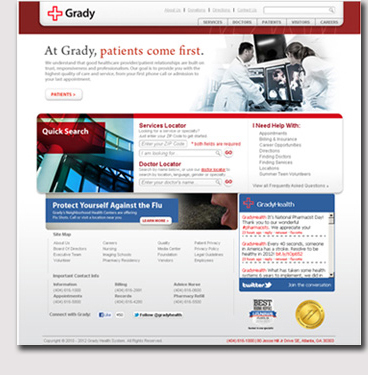 Grady Health System was one of WebXpert's first clients. Grady engaged with WebXperts in 1999 and used our team for 5 years. WebXperts created many websites and provided Internet consulting for the largest Level 1 Trauma Center in the southeast. WebXperts was the primary vendor for this large institution's Internet development needs. WebXperts created and hosted Grady Health System's primary website, the Henry W. Grady Foundation's website, and the Grady Schools of Radiology's website. During this time, WebXperts identified an area in the hospital that it could make more efficient with an Internet based application. Our team proposed a large scale revamping of the vendor bidding and selection process. WebXperts was chosen to build a large scale procurement application and was picked to train the vendors nationwide.